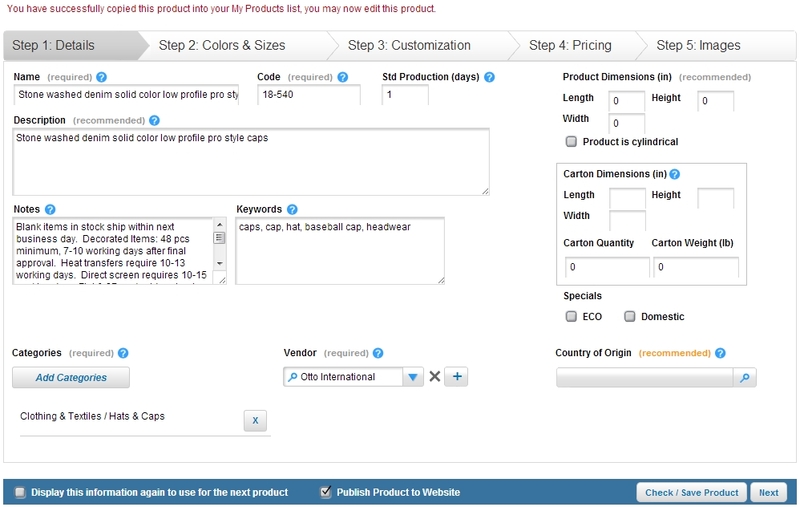 This unique feature allows distributors to locate any existing supplier's product on their Customer Focus website, and copy it into their 'My Products' catalog. Typically used for company store creation, this enables the distributor to amend pricing, images and sizes so that the product can be customized on a website by website basis. Step 1: Click on Products > Find a Product. Step 2: Find the product that you wish to copy. Click on the Copy to My Products button at the top right. You may wish to review our help sheet for adding products here. Step 4: Finally click on Check / Save Product to make the product live on your Customer Focus website. The copied product is a clone, therefore not linked to the supplier product and would not receive supplier price updates etc.